SalesNOW’s Gmail integration delivers improved productivity for Gmail users. Many of us love Gmail for its web-based flexibility. SalesNOW’s Gmail extension makes your Gmail even more useful. Users can save emails, create SalesNOW Leads, Opportunities and Cases and schedule activities such as Calls, Meetings and Tasks all from within their Gmail account. 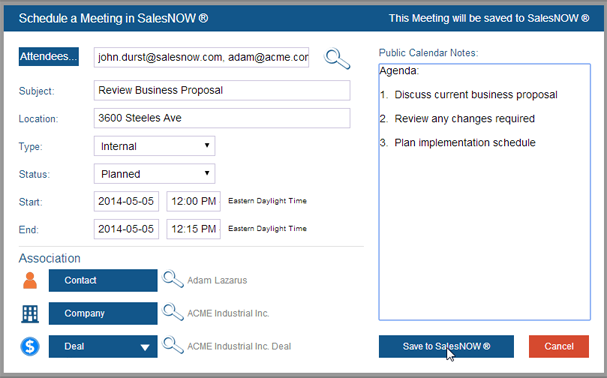 All Meetings and Calls created will also update the Gmail calendar and will send out invitations to any invited attendees. When the user opens up an email received through Gmail, the SalesNOW extension will search SalesNOW for the matching Contact. 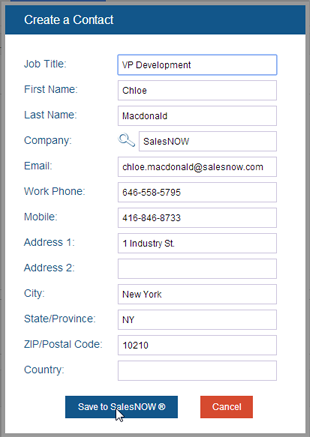 If the contact exists in SalesNOW the system will populate the extension with this contact's information and history. If the contact is not in SalesNOW, the extension will give the user the ability to add the contact to SalesNOW. The user can then save the email to SalesNOW and associate the email to the Contact, Company, Lead, Deal or Case selected. Users can also save brand new emails and messages part of a thread. Using the Gmail Extension the SalesNOW user can schedule a SalesNOW call or meeting and associate the call or meeting to the selected SalesNOW Contact, Company, Lead, Deal or Case. Any meeting or calls created using the extension will also create a Gmail calendar entry and will automatically leverage the Gmail invitee process to send out meeting invites and to manage proposed changes received from your invitees. Using the SalesNOW Gmail extension, the SalesNOW user can add SalesNOW contacts associated to emails received in Gmail. From the Gmail extension, the SalesNOW user can also access the Contact’s SalesNOW history and can create new leads, opportunities and cases for that contact.